One of our family’s favorite meals on a Sunday is brunch! Typically, we will enjoy a family brunch together after Sunday service. Some of our favorite brunches happen to be casseroles so I wanted to share one of our top brunch recipes with you all. If you have not tried this Easy & Cheesy Tater Tot Casserole with Breakfast Sausage you are totally missing out!! 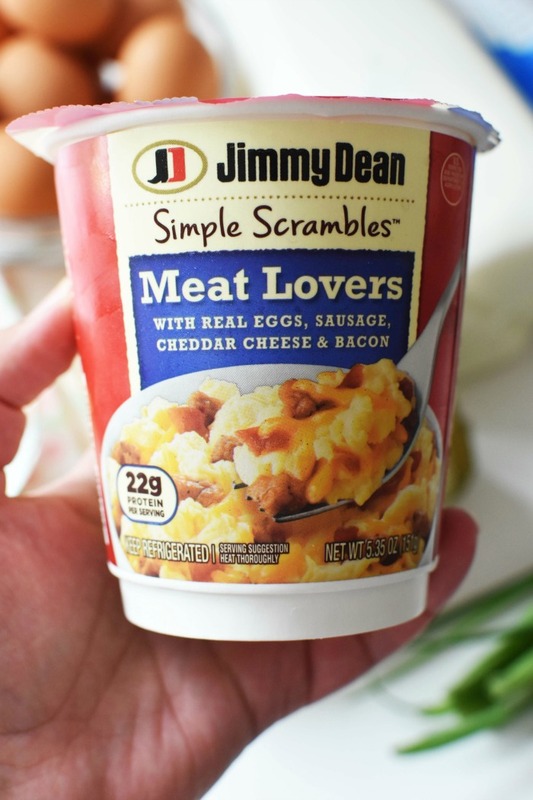 Made with fresh Jimmy Dean® Regular Premium Pork Sausage, tater tots, eggs, cheese, milk, and did I mention cheese? Haha! If you cannot tell, we are all about the cheese in this house!! There is something so delicious about enjoying the savory, crispy pieces of the pan-browned Jimmy Dean Regular Premium Pork Sausage Roll enveloped in the melty cheddar. This recipe is super delightful and perfect for Father’s Day which is coming soon! 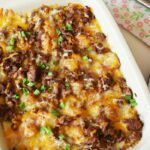 Of course, you do not need any occasion to enjoy this delicious brunch casserole with your family, but I know my husband loved this Cheesy Tater Tot Casserole with Breakfast Sausage-and so do my 3 kids! My girls LOVE when this pops up on the menu and always request seconds! The reason they love this sausage tater tot casserole so much is because it is made of ALL their favorites baked in one dish! 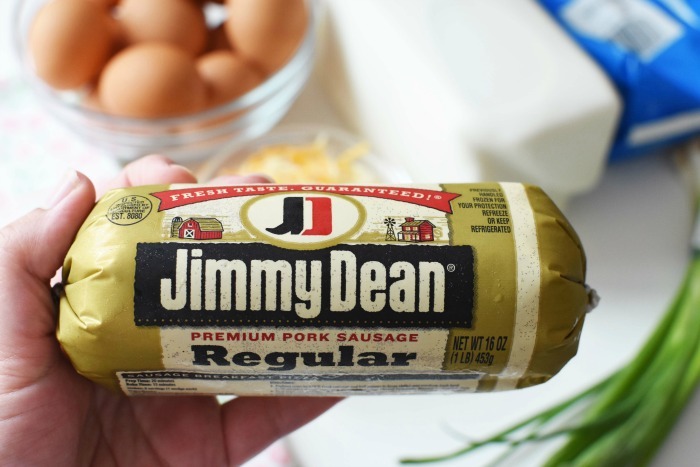 I love using Jimmy Dean Regular Premium Pork Sausage Roll because it is made with a unique savory blend of Jimmy Dean signature seasonings; fresh, high-quality pork sausage. The roll is super convenient because there is no chopping, or processing necessary. Simply open the roll package, add it to your skillet, and brown. I have been loving my cast iron skillet lately, and find it does such a wonderful job at browning the sausage to perfection! Plus, it gives my food an extra iron boost that I need since I am anemic. For this Easy & Cheesy Tater Tot Casserole with Breakfast Sausage, I purchased all the ingredients at my locals Shaw’s supermarket. There, I was able to not only save money but find everything I needed conveniently throughout the store. Speaking of saving money, for a limited time, you can save $1.50 with the purchase of TWO (2) participating products. 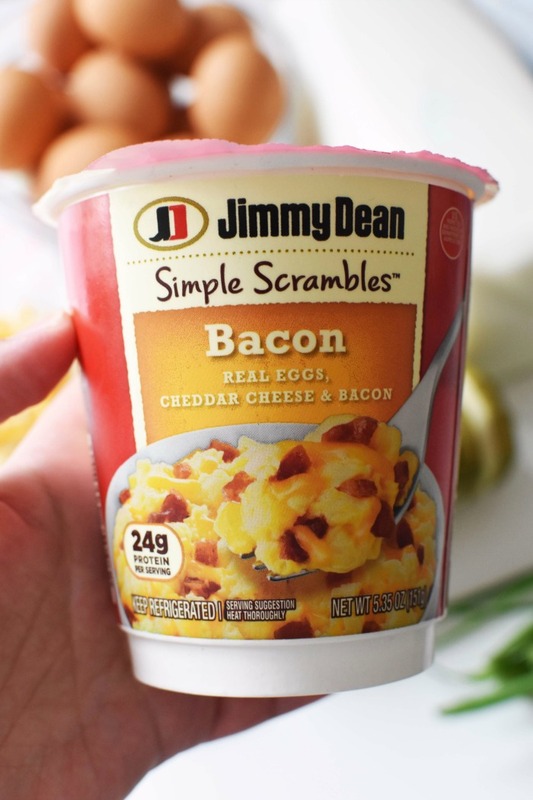 Besides having an abundance of high-quality sausage and bacon products, Jimmy Dean also has a new line of products that you can enjoy any time of the day in under a minute! 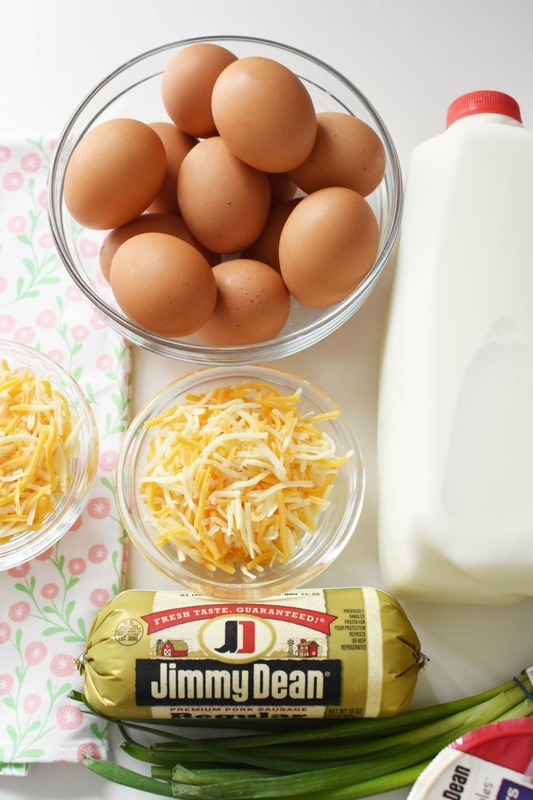 Have you tried Jimmy Dean Simple Scrambles Breakfast Cups? These easy to make cups feature a scrambled egg mixture and mix-ins like crumbled sausage or bacon to make what tastes like a scrambled omelet in a cup. They take ONLY seconds to make too! 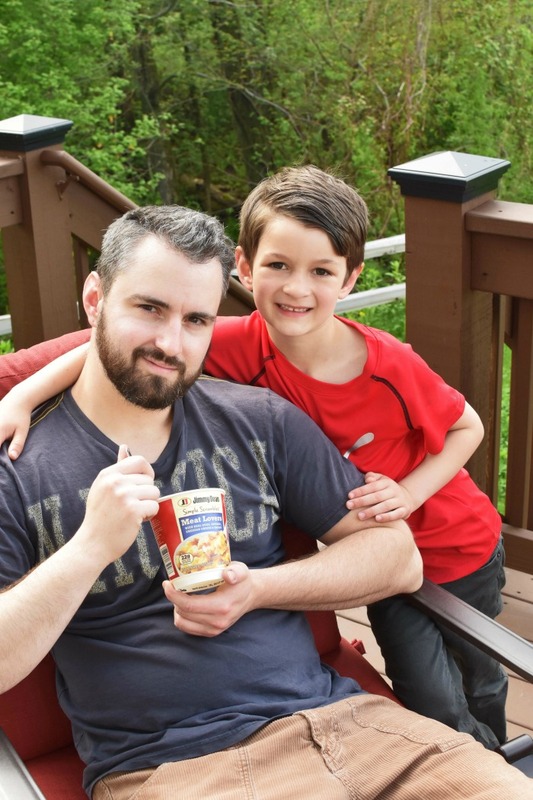 Jared is really loving them as the perfectly tasty protein source he craves after his workouts! They are found in the refrigerated section at Shaw’s and cost a little over $2 regularly. If dad is busy on Father’s Day, this could make the perfect breakfast on the go, or breakfast in bed addition. 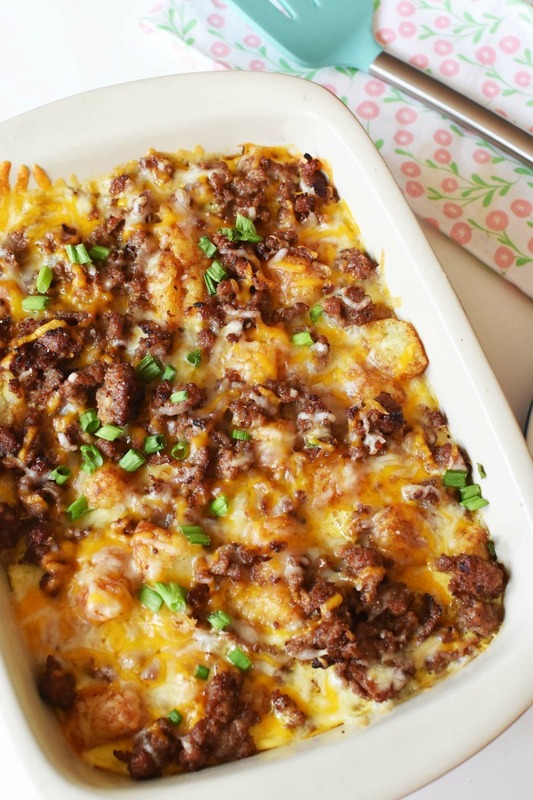 But, if you have a little more time this Cheesy Tater Tot Casserole with Breakfast Sausage is the winning recipe for your meat and cheese loving dad! You can get the printable version of this recipe below as well! 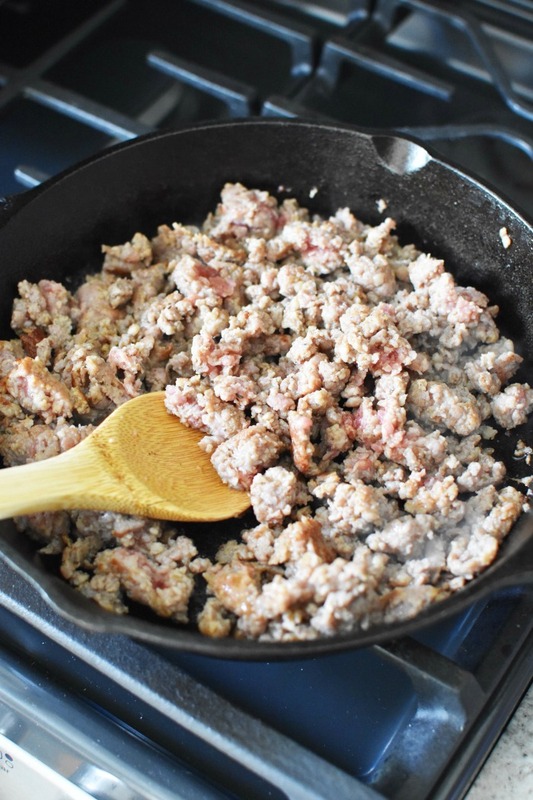 Brown sausage in a skillet until done, set aside. In a large bowl, combine the eggs, milk, and spices. Line a casserole dish with all the tater tots. Pour the egg mixture over the sausage and tater tots. Bake for 25 minutes on 375. Remove from oven, and add sprinkle cheese, and green onion. 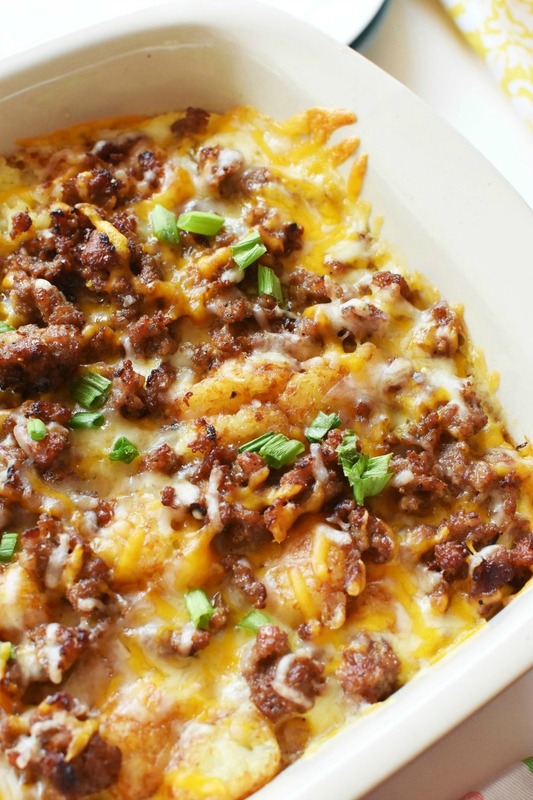 Treat your dad to this Easy & Cheesy Tater Tot Casserole with Breakfast Sausage and let us know how you liked it below! 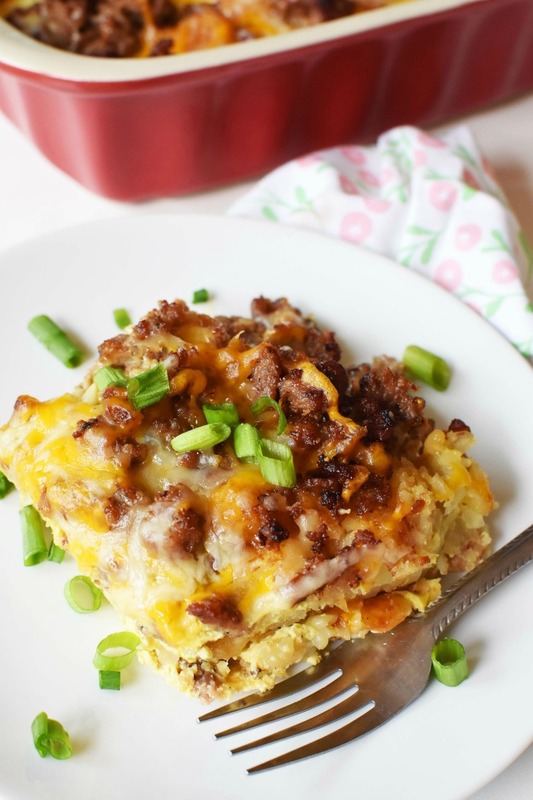 A cheesy and savory breakfast casserole that is perfect for lunch! It combines the savory flavors of cheddar, sausage, and tater tots with little cooking skill involved. Perfect for Father's Day! Heat oven to cook tater tots until done -about 20 minutes. Pour the egg mixture over the sausage and tater tots. Bake for 25 minutes on 375. That looks like the best casserole ever! It has everything that makes a tasty breakfast. Om nom nom. This looks like an amazing casserole. I know it would be a big hit in my house, I will have to give it a try! Looks delicious. Oh I want to make this for this weekend. What s not to love? 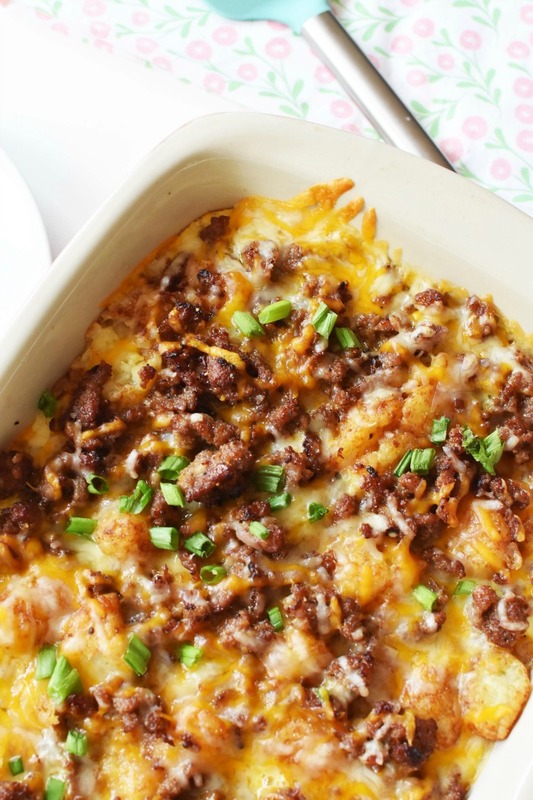 This casserole looks absolutely delicious! I love tater tots so this would be perfect for me to make – we always have tater tots in our freezer. This looks amazingly good! Would be great to try this weekend!